These charms can also be riveted or glued in place! Star Trek? Look no further! 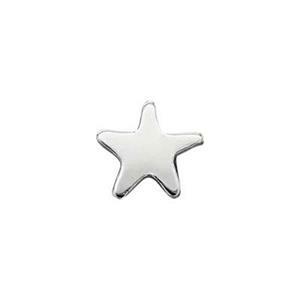 Our SL140 – Bright Sterling Silver 24 Gauge Tiny Star Solder Ornament. Solder, Rivet or Glue in Place. See our complete line of Soldering Supplies. Notes: SL, SU and SB prefix blanks are stamped or die struck. This type of manufacturing may leave light scratches on the surface. Since this type of scratching is normal it is not considered a product defect. Blanks may require finishing. If you require a mirror finish please choose SN or S1 prefix blanks.